Anything can be made better with sprouts. I'm not a fan of Christmas and the only thing getting me through this whole tacky season is the ability to indulge in my favourite vegetable. Oh, sprouts! I just don't understand how anyone could dislike this humble little green. Boiled, braised, roasted...I'll take them all. 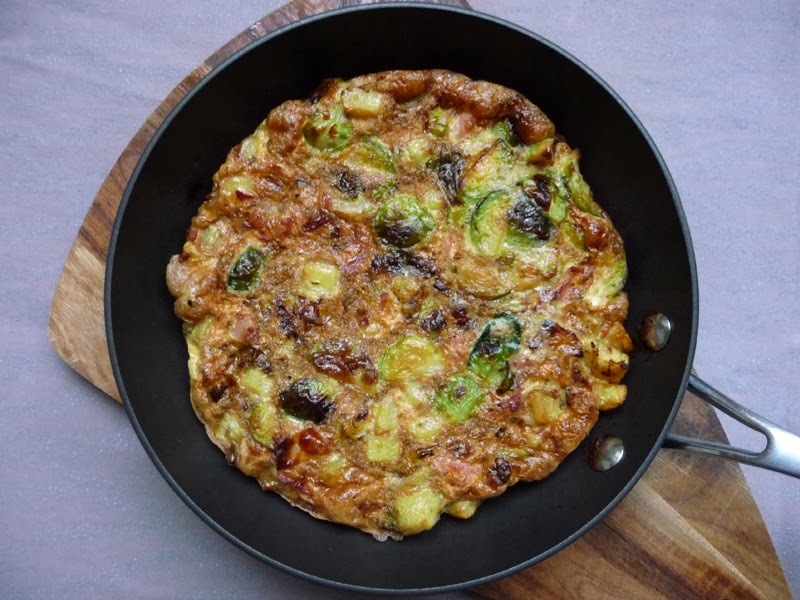 So many people just have them as part of a roast dinner but they are versatile, like this quick-ish, hearty frittata, made all the more festive with sprout's best friend, bacon. For this recipe I tested out the Simply Perfect skillet by Raymond Blanc for John Lewis. For the mid-price range, I thought this pan was really decent value, well made, heavy and easy to clean. I've been using it all week and foods do not seem to catch on it as quickly as some of my cheaper pans and cooks foods evenly. The handle is elegant and looks great although I am one of those idiots that will grab the handle that has just been under the grill so heat resistant rubber is probably best for me! See the full range at Raymond Blanc for John Lewis. Preheat the grill to medium/high heat. Heat olive oil in a heavy frying pan (roughly 20cm in diameter). Fry the onion until softened, but not browned. Turn up the heat and add the bacon, sizzling until crisp. Remove the bacon and onion and set aside. Wipe the frying pan clean and add the prepared sprouts and cubed potatoes with a good splash of water. Cover for 5 minutes. Uncover and continue to cook until the water has evaporated, add another splash of olive oil and fry until the vegetables are soft and start to crisp up (about 10 minutes). Beat the eggs with the creme fraiche and thyme leaves. Season well then mix in the onion, bacon and vegetables, combining well. Give the pan another wipe and add another splash of olive oil followed by the egg mixture, giving the pan a good shake to settle the ingredients. 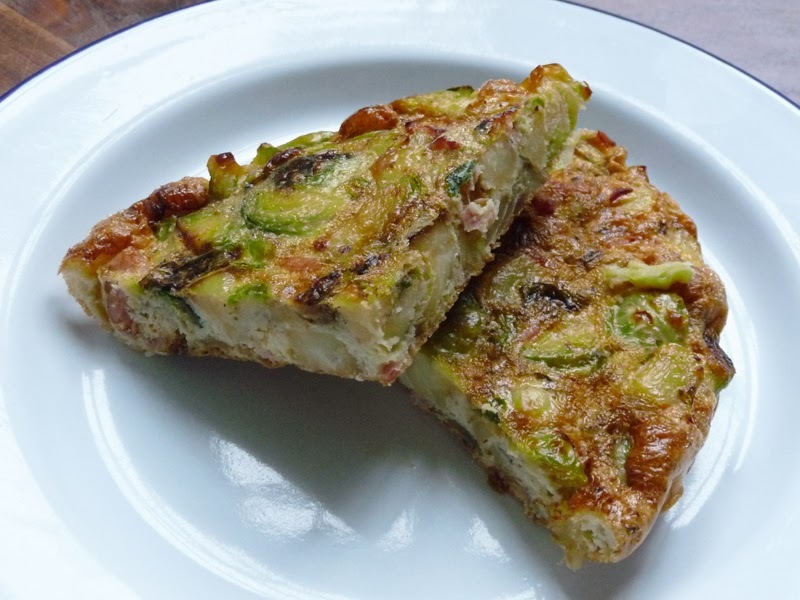 Cook for a few minutes to seal the base of the frittata before transferring to the grill for 5-8 minutes until cooked all the way through and starting to brown on the top. Turn out onto a plate and eat hot or room temperature. I was sent the skillet to review by John Lewis.